Unless otherwise noted, the text on this page is original to Clausewitz.com and is ©Clausewitz.com. Much of it was donated, however, to Wikipedia. 2. Why is he so famous? 6. Where can I find some choice quotations? 1. Who was Carl von Clausewitz? See the biographical chronology below. A fuller biographical treatment is here. Do you know which translation you have? Clausewitz's fame is largely due to the importance and influence of his magnum opus, On War, unquestionably the most important single work ever written on the theory of warfare and of strategy, although both the book and its impact have been interpreted and misinterpreted in wildly varying ways. His theories are of interest to military strategists, historians, political scientists, business thinkers, and scientists (although Clausewitz's own discussion is not overtly mathematical and Clausewitz laughed at the notion of a "science of war"). A discussion of problems in the modern application of his works is here. Clausewitz has been read—or at least commented upon—by a great many important soldiers, writers, and thinkers, among them the Duke of Wellington, Moltke (the elder), Hans Delbrück, Spenser Wilkinson, Julian Stafford Corbett, John McAuley Palmer, B.H. Liddell Hart, J.F.C. Fuller, Lenin, Hitler, Mao (see discussions in English, French, and German), Patton, Dwight Eisenhower, Henry Kissinger, Caspar Weinberger, and Colin Powell. However, Clausewitz was an interesting personality in many other ways and has attracted the attention of historians and biographers for reasons that sometimes have little to do with his reputation as a theorist, per se. The romance and unusual intellectual relationship between Clausewitz and his wife, Countess Marie von Brühl, is one such reason: consider how surprising it is that the West's greatest work of military theory was edited and introduced in the 1830's by a woman. From 1802 on, Clausewitz lived and worked at the center of the Prussian state and knew virtually everyone of any importance or distinction. He played an important though junior role in the resurrection of Prussia after its near-destruction by France in 1806/07. His name was quite well known in Prussian society and he was among Prussia's national heroes after the wars of 1812-15. Even though he was a relatively junior foreign officer in the Russian army in 1812, he appears as a minor character in Tolstoy's War and Peace. He played a key role in negotiating the Convention of Taurrogen that neutralized the Prussian corps in Napoleon's Grande Armée and eventually forced Prussia to join the anti-French coalition. During the 1815 Waterloo campaign, the Prussian army corps of which he was chief of staff played a key role (fighting at Wavre) in the final victory over Napoleon. Clausewitz's important study of that campaign drew Wellington into writing his only serious essay on the subject. His writings provide important first-person, historical, and analytical commentaries on key events of the dramatic Revolutionary era. (On War represents only three of the ten volumes of his collected works, and even the full set of these volumes leaves out many important articles, papers, lectures, and his voluminous correspondence.) Any list of Prussia's great figures is likely to include him—see, for illustration, Rainer Ehrt's set of caricatures of Prussian historical figures, in which Clausewitz figures prominently alongside famous kings, commanders, and cultural figures. Of all the "great books" in the Western canon, only two address the fundamental problems of war and strategy. One is by the Athenian writer Thucydides: The Peloponnesian War (c.400 B.C.). The other is Clausewitz's On War (1832). Unlike many other great books, however, the ideas Clausewitz proposed have never been fully absorbed into the mainstream in the manner of, say, Adam Smith's work on capitalism. This is due partly to the depth and difficulty of the original work and to the unusual dialectical character of Clausewitz's approach, but also to the startling modernity of his concepts: Recent studies have made clear the similarities between Clausewitz's world-view and such modern scientific approaches as nonlinearity and complexity theory (see especially Alan Beyerchen's work on that subject). After more than a century and a half, Clausewitz's work remains the most comprehensive, perceptive, and (in key respects) modern contribution to political/military and strategic thought. In whole or in part, it remains required reading in America's intermediate-level and senior military schools, as well as in many civilian strategic studies programs. For example, the National War College's AY 2008 instructor's guide to On War is here. Whether these PME schools or official doctrine actually capture the meaning and value of Clausewitz's work remains a subject of energetic debate. Clausewitz's approach is also increasingly taught in business schools. An ambitious recent abridgement of On War aimed at business strategists, originally published in the U.S.A., has been translated into German, Italian, Korean, Japanese, Polish, Portuguese, Russian, and Turkish. Comments on Clausewitz by Jack Welch, the famous Chairman and CEO of General Electric, are here. A major attraction of Clausewitz for modern strategic thinkers is that he does not attempt to sell them a program or prescribe solutions. He understands that his readers will face a strategic world unpredictably different in many respects from his own. Rather, his theory is essentially descriptive of the nature of human-on-human strategic problems; his purpose is to develop our human capital—i.e., to help the reader develop his or her own strategic judgment in order to deal with the ever-changing strategic environment. Recently published major books in English about Clausewitz (at least 15 in English alone since 2000), are available from Amazon.com or elsewhere and can be found listed/linked here. European interest has spiked as well, motivated in part by well-founded suspicions that the Americans—despite all the attention they've lavished on Clausewitz since the debacle in Vietnam—have missed or misconstrued his key conceptions. Evidence of this renewed European interest can be found in our English, French, German, Japanese, Spanish/Portuguese, and "Other" bibliographies, but much of this European work tends to be published (primarily or in translation) in English. Still, On War is—unavoidably, given the nature of its subject and the sophistication of Clausewitz's approach—a tough, challenging work to read. The original German is itself notoriously difficult. Many modern Germans actually prefer to read it in the latest (though not the best) English translation for its relative clarity. That "clarity," however, has come under increasing suspicion from modern Clausewitz scholars, who argue that it was achieved at the cost of oversimplifying and distorting some important aspects of Clausewitz's argument. The many translations of On War into other languages have magnified these problems by introducing new distortions along national and linguistic lines. These difficulties compound older problems rooted in the fact that On War is based on a set of unfinished drafts written over a long period of Clausewitz's dynamic intellectual evolution. These various drafts were assembled into a finished book by his wife Marie after his untimely death. Beyond these sources of difficulty, Clausewitz's world-view is hard to understand without some grasp of the historical period in which he worked and the cultural currents of his milieu. Perhaps even more fundamentally, Clausewitz's internal model of reality is baffling to many minds. He was an eminently scientific thinker, but his understanding of cause-and-effect relationships in real-world events seems odd, idiosyncratic, or even "mystical" to readers reared in the linear science and mathematics of the pre-computer era. Clausewitz's world-view is not at all surprising, however, to those familiar with science and mathematics as they have evolved since the advent of powerful computational tools able to handle the requirements of nonlinearity. Unfortunately, a great many modern writers in the fields of war, strategy, military history, etc., base their understanding of the modern concepts of mathematical nonlinearity and complexity science on a vague impression of the term "Chaos Theory." They appear to have read nothing (or worse, some social-science summary) about these pervasive aspects of virtually all modern science and assume that they reflect some kind of "New Age" mysticism. One of the best introductions both to nonlinearity and to Clausewitz is by historian Alan D. Beyerchen: Clausewitz, Nonlinearity and the Unpredictability of War, International Security, 17:3 (Winter, 1992). Many writers unfamiliar with Clausewitz's actual purpose and meaning are repulsed by his famous line that "war is merely the continuation of policy by other means." Part of the problem is that this is neither the best translation of the original wording nor On War's most definitive statement of the concept. Critics also argue (quite correctly, for both ethical and practical reasons) that war should not be seen as just another routine tool for politicians—but Clausewitz would have agreed with that argument in practical terms, for he saw war as a very risky and uncertain instrument. They also object to his rejection of moderation in war as an essential element of war itself (and fail to note his explanation as to why moderation is nonetheless and necessarily pursued by civilized societies as a matter of practical policy). The claim is frequently made (especially by British historians) that Clausewitz's ideas "caused" the disasters of World War I. An actual look at the evidence (a rare undertaking) indicates that this view is quite false—at best, simplistic to the point of meaninglessness. Much of the disagreement over On War, however, reflects fundamental issues that Clausewitz did not address in any detail. That is, On War is a book that, for all its length, attempts to focus narrowly on the practical problems of conducting military operations in war—it does not attempt to describe the character of the physical universe or the nature of man, nor to define such basic concepts as policy, politics, society, or the state. It is simply a mark of the book's profundity that discussion of it inevitably raises all of these issues. Writers with varying views on these fundamental matters inevitably interpret Clausewitz in varying ways—especially when they deal only with isolated quotations (or rumors of quotations) frather than wrestle comprehensively with Clausewitz's overall treatment of the problem. Since relatively few people read Clausewitz's original work for themselves, the present-oriented work of his proponents leads to a pattern of Clausewitz's being declared obsolete every time there is some broad change in the world political/military situation—as, for instance, with the end of the Cold War. Clausewitz invariably gets resurrected, however, as every new generation of creative thinkers goes looking in the classics for fundamental strategic insights with relevance to their own eraespecially when popular new military or strategic ideas prove shallow or disastrously wrong. The principal importance of Clausewitz's approach to strategic theory is its realism. By this we do not mean "Realism" in the terms of certain political science theories or of mere cynicism about politics and naked power, although the latter is not lacking in On War. Rather, Clausewitz's approach is profoundly realistic in that it describes the complex and uncertain manner in which real-world events unfold, taking into account both the frailties of human nature and the complexity of the physical and psychological world. - war as a continuation or expression of policy/politics/Politik. - strategic and operational centers of gravity—click here or here. - the "culminating point of the offensive." - the "culminating point of victory." - a dialectical approach to military analysis. - the methods of "critical analysis." - the nature of the balance-of-power mechanism. (or see this short discussion). - the asymmetrical relationship between attack and defense—and a deeper discussion here. - the nature of "military genius" (which is not primarily an intellectual attribute). - the "fascinating trinity" of war—or go in depth. - limited war vice war to render [the enemy] politically helpless or militarily impotent"—click here for a self-paced PowerPoint tutorial, or see this discussion. - "absolute war" vice "real war." - the "fog" of war—see this discussion (by Jennie Kiesling). - the essential unpredictability of war. Unfortunately, one very annoying thing about Clausewitz is that, in order to understand his thinking and its value, you actually have to read his book (with your brain on and your mind open)—rather than some convenient précis, written, most likely, by some wannabe-competitor, propagandist, special pleader, historical hack writer, or Clausewitzian website editor. Even if it is honestly and competently done, any attempt to summarize Clausewitz is inherently misleading. This is true in part because Clausewitz's dialectical method is at least as important as any particular insight that he offers. But all of Clausewitz's insights are woven together in a fascinating whole; efforts to extract particular "nuggets" are destructive to a genuine understanding. The real value of On War lies not in some easily grasped (and easily perverted) notion like "center of gravity." Rather, it lies in the opportunity for sustained contact with one of the truly great thinkers of Western civilization as he wrestles with the vital problem of War. And that is something no serious person should avoid. As Trotsky so elegantly put it, "You may not be interested in war, but war is interested in you." Open as a new page. 7. Which translation of Clausewitz's magnum opus, On War, is the best? And which translation do I have? Instructors teach Clausewitz in a variety of ways—using different styles, pursuing different purposes, and proposing widely varying interpretations. Some merely assign him to individual students as a term-paper or book report/review subject. Others spend a day, a week, or an entire semester course on him. Here are some potentially useful videos. Christopher Bassford, "Clausewitz and His Works"—a summary. Michael Handel (Naval War College), "Who Is Afraid of Carl von Clausewitz? A Guide to the Perplexed." Ilana Kass (National War College), "An Instructor's Guide to Teaching Clausewitz," 2003. Christopher Bassford, A Two-Seminar Intro to the Study of Clausewitz (2013). This is designed for PME schools, which typically provide a short introduction to Clausewitz, usually based on reading exclusively and directly in the Howard/Paret translation of On War, treating Clausewitz as an isolated topic not otherwise utilized in the curriculum. It is an aberrational class design, in that it makes a serious effort to place Clausewitz and his ideas in the context of his time and of his reception in political/military theory ever since. See also this accompanying set of slides and graphics (MS PowerPoint), designed for instructor training. Jon Sumida (University of Maryland), Syllabus: HISTORY 419M—Special Topics in History. "Classical Military Strategic Theory: Clausewitz." This is a full-semester course on Clausewitz. Jan Willem Honig, King’s College London Department of War Studies, SYLLABUS: SWM 118: Clausewitz: Ideas and Legacy. Postgraduate 2006–2007. We will be adding more to this list as opportunity permits. 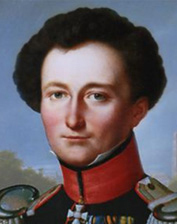 More excellent on-line readings on various aspects of Clausewitz and his ideas can be found here. For published books by or about Clausewitz, try the Clausewitz Bookstore—we're not really in the book-selling business, but this will show you what's available in print in English, German, and French. Several of his writings, including an obsolete (but still useful) English translation of On War, the original text in German (Vom Kriege), a number of his campaign studies, etc., can be found here. See also our bibliographies in several languages and subject areas, which contain many active links. Some recent news articles referring to Clausewitz are described and linked here. We also have a major book on this subject on-line, Christopher Bassford's Clausewitz in English: The Reception of Clausewitz in Britain and America (New York: Oxford University Press, 1994). June (or July) 1, 1780: born Carl Philipp Gottfried von Clausewitz in Burg, Kingdom of Prussia. 1792: enters the Prussian army as a cadet (Fahnenjunker) in 34th Infantry Regiment. 1793-1794: fights in the campaign against France. 1795: in garrison at Neuruppin; is promoted to lieutenant. 1801: admitted to the war academy in Berlin, directed by Scharnhorst. 1804: graduates with top ranking at the academy. Is named aide-de-camp to Prince August of Prussia. Meets Marie von Brühl. 1806: fights in the campaign of 1806, is captured by the French. 1807-1808: in captivity in France and Switzerland. 1808: becomes assistant to Scharnhorst and takes part in the reorganization of the Prussian army. 1810: appointed professor at the academy of war and made responsible for the military education of the crown prince; marriage to Countess Marie von Brühl. 1812-13: refusing to collaborate militarily with France, leaves the Prussian army and joins the Russian army. Leaves manuscript of Principles of War as an instruction for the crown prince. Fights throughout the campaign in Russia, plays a key role in bringing about the defection of Yorck's Prussian corps from the French army, becomes Russian liaison officer with the headquarters of Blücher, then is appointed chief of staff of the German-Russian legion. 1815: fights in the Waterloo campaign as chief of staff to General Thielmann's III Prussian army corps. 1816-1818: serves on General Gneisenau's staff in Coblentz. 1818: promoted to Major-General; named director of the war college in Berlin, an administrative post that he will occupy until 1830. During these 12 years, he will be devoted primarily to research. 1830: appointed chief of staff to Gneisenau's army, placed on the Polish border to contain the Polish Revolution. November 16, 1831: dies in Breslau of cholera contracted in the field. Clausewitz's tomb is in the city cemetery at Burg. Clausewitz's Major Works, especially On War (Vom Kriege), were published after his death under the care of his wife, in Berlin from 1832 to 1837. Click here for English, French, German, Japanese, Spanish/Portuguese, and "Other" bibliographies of his published work. Clausewitz's name. The exact composition of Clausewitz's name is a matter of some dispute, and in any case precision in such matters was not a characteristic of early modern societies. It is often given as "Carl Maria von Clausewitz," which is clearly wrong (even though "Carl Maria" is a perfectly normal German name construct). This mistake is probably derived from the name of Clausewitz's wife, Marie. This error is sometimes a useful "genetic" marker for the source of a subsequent writer's information—we've noticed that loyal students of the scholar who originated it tend to use it themselves or to avoid using the middle names entirely. Peter Paret, on the other hand, gives the name as Carl Philipp Gottlieb von Clausewitz. Since Paret is a capable scholar on the historical Clausewitz, we would normally be inclined to accept this view (which is probably based on hand-written birth records). However, Clausewitz's tombstone clearly gives the name as "Carl Philipp Gottfried von Clausewitz." While fog and friction pervade all human activities, we are inclined to believe that Clausewitz's family—especially the devoted Marie—would have demanded that his monument reflect their own opinion on the matter. The most likely reason for the Gottlieb/Gottfried disconnect is that neither Clausewitz nor his contemporaries either knew or particularly cared which name was technically correct. However, in the unlikely event that you and your partners in conversation are unable to find anything else in the field of Clausewitz Studies to disagree over, this issue is one that remains unresolved. Another issue is the spelling of his first name—"Carl" or "Karl"? Clausewitz himself spelled it with a C, so that is the preferred spelling. He did this in order to emphasize his identification with the classical and Western tradition. Many modern writers, however, choose the K in order to emphasize his Germanic origins. The use of "Karl" is thus often a warning of a hostile treatment, though not always. Translations. The widespread preference for the English version derives at least in part from the current military dominance of the United States and the consequent need to understand the specifically American understanding of Clausewitz's approach to war. Of course, the perceived "relative clarity" of the Howard/Paret translation suggests that it may contain some deviation from the original, not only in form but possibly in tone, content, and meaning as well. This is necessarily true of all translations, and some of the transnational arguments over Clausewitz no doubt derive from such issues. Nonetheless, Clausewitz.com recommends the much more precise Jolles translation. If you are interested in finding On War in other languages, click here. For a discussion of the various English translations and some recommendations, click here. * According to Xia Zhengnan, Jiedu Zhanzhenglun [Interpreting On War] (2nd edition), Beijing: Jiefangjun Chubanshe [The PLA Press], 2005, pp. 680-682. Cited in Yu Tiejun, "The Western Master and Bible of War: Clausewitz and His On War in China," Clausewitz Society [Clausewitz Gesellschaft, Hamburg], Reiner Pommerin, ed., Clausewitz Goes Global: Carl von Clausewitz in the 21st Century (Commemorating the 50th Anniversary of the Clausewitz Society] (Berlin: Carola Hartmann Miles Verlag, 2011), pp.43-60.